Circumnavigate the globe in Victoria’s most culturally diverse locality. Experience the delicious abundance and tempting aromas of global cuisines, cultures and entertainment at this enchanting world food fare extravaganza, as part of Melbourne Food and Wine Festival. Visitors will be swept up by the irresistible flavours of the nations uniting under the Dandenong Market roof. From Afghanistan to Zimbabwe, and the various stops in between, you will be tempted, enchanted and entertained at every step of your journey. With music and dance performances and beautifully presented food, let your senses transport you afar. Hawker market stalls, canopied stands, hot and cold offerings, sizzling hot plates, barbecues, steamers, and the famous Afghan Tea Cart. The amazing line up of entertainment includes global music sensations Systa BB (3RRR Producer and Presenter), Massive Hip Hop Choir, Le Soul, Tumbarumba, Scatter Scatter Sound System, DJ Manchild (PBS 106.7FM Producer and Presenter) and the Cook Islands Royal Polynesian Dance Group. 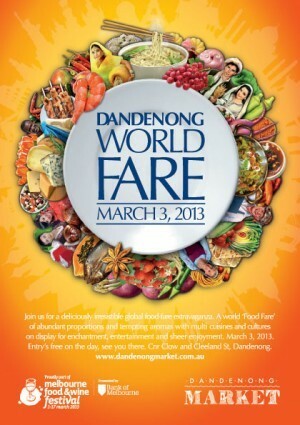 Grab your friends and family and make the Dandenong World Fare your destination.